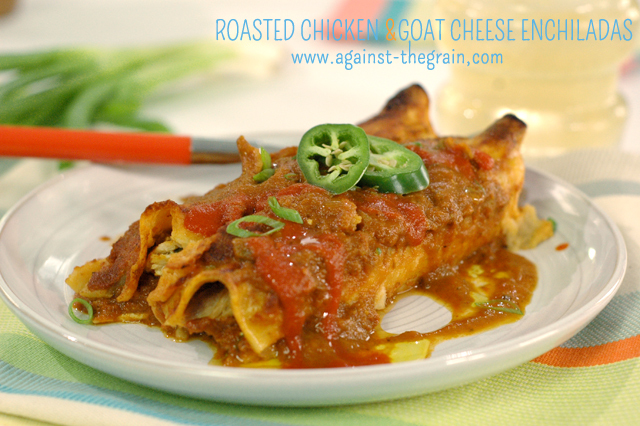 SO it’s football season as I am writing this post and wanted to share this awesome recipe from Alex Thomopoulos (a stand-up comic turned chef and passionate food enthusiast) for gluten free enchiladas. You can see her video HERE. Check out her blog for other fabulous recipes and BE SURE to watch the videos, she is quite entertaining! 18 (6 inch) corn tortillas, warmed in oven or microwave. Char poblano peppers over an open flame. Place peppers in a bowl and cover with plastic wrap. Set aside for 8-10 minutes until skins softened and are easy to remove. Seed and stem poblano peppers. Chop finely. Heat olive oil in a sauté pan over medium-high heat. Add the onion, garlic and sauté until onions become soft and translucent, about 6-7 minutes. Sprinkle in the oregano, cumin, paprika, chopped poblano, and salt. Continue to cook another 3-4 minutes until vegetables begin to caramelize slightly. Deglaze pan with the wine and scrape any brown bits from the bottom of the pan. Let wine reduce to almost nothing before adding in the tomatoes, chicken stock, and sriracha. Simmer uncovered for 30 minutes. Allow sauce to cool. Transfer to blender or food processor and puree until smooth. Adjust salt to taste. For the Filling: in a bowl combine shredded chicken, goat cheese, cilantro, and half of the scallions. Set aside. To assemble enchiladas: ladle enough sauce to just coat the bottom of the baking dish. Dip each tortilla in remaining sauce to coat and fill each one with about 2 tablespoons of the chicken mixture. Roll tortillas into 1 1/2 inch enchiladas. Place enchiladas seam side down in the baking dish. Set aside 1/2 cup of sauce and pour remaining sauce over top. Bake enchiladas in pre-heated oven on middle rack for 20-25 minutes or until enchiladas are crispy and brown around the edges. Top with reserved sauce, sliced scallions, and jalapenos. Serve.